Dimensions (HxWxD): 29" x 19" x 14"
The Swingline™ DS22-19 shredder is a departmental strip cut shredder; meeting the needs of small departments. The strip cut shredder shreds paper, optical media, credit cards, staples, and paper clips. The Jam Free™ technology enables the Swingline™ DS22-19 shredder to shred continuously. 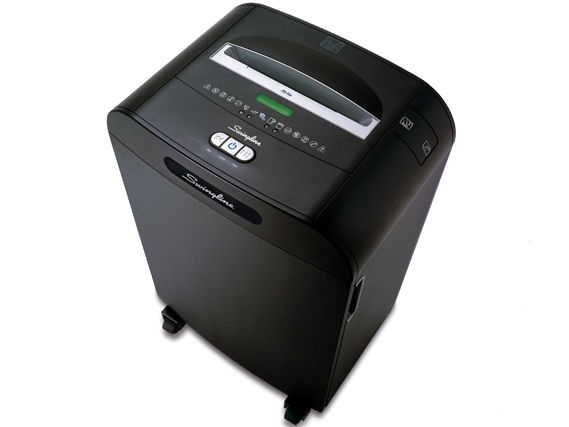 The Jam Free™ shredder blinks when excessive papers have been fed, and stops shredding. The Jam Free™ shredder includes thermal overload protection. The strip cut shredder automatically goes into sleep mode; reducing energy costs. The Swingline™ DS22-19 shredder has a wire-frame waste bin configuration; the Swingline™ shredder features a bin full indicator. The Swingline™ shredder has a lifetime warranty on the cutting blades.